The 2018 World Cup is underway and wow, what an exciting tournament it has been so far. 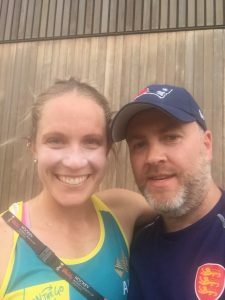 I wanted to share with you all some insight into this wonderful event but from a few different perspectives. Enjoy! What does an average tour day look like? Each day is very different whilst on tour depending on what phase of the tournament we are in. In the lead up we train every day and do most of our scouting for each team. Once the tournament starts the focus is on preparing ourselves for each game so in between its all about rest, recovery, nutrition and hydration. Most days we will still train as this is the best way for us to keep progressing throughout the tournament. It is also an opportunity to work on specifics relating to each team we play. The sessions will be light and will usually involve corners, one on ones and plenty of shooting. Third World Cup, how does this one compare? 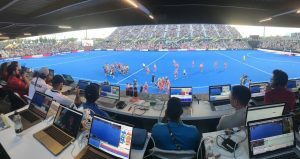 I have been so fortunate to play world cups in both Argentina and Holland where hockey is absolutely huge! England have done a great job in promoting the event here but as is often the case, only the home team games are drawing large crowds. The last world cup in Holland was a real highlight in my career as we won silver and had a wonderful tournament as a team. 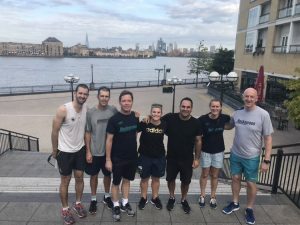 Here in London we have an exciting group with some amazing potential so hopefully this time we can go one better and take the gold. How do you manage the pressure of wc games? I actually really enjoy pressure! Throughout my career I’ve learnt to really look forward to the high pressure moments and games which certainly helps relieve any fear or doubts. 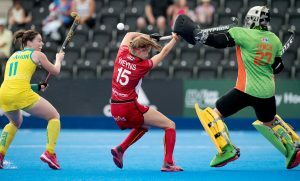 In a tournament like the World Cup you need to be on for every game as the competition is so tough so we all put the pressure on ourselves to perform. As a goalkeeper I know there will be moments where ill be called in to action to help keep us in a game and I love having that role. How would you describe your view of the World Cup? I’m very lucky to get one of the best views at the stadium. We have an allocated area for the Analysts quite high up and side-on to the pitch. There are desks and seats for us to work on and we get a live feed of the camera footage to our laptops. To my left is Carlos from Argentina, and to my right are the Dutch boys, Joost and Lars. Who do you spend most of your day with? 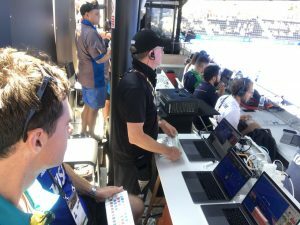 I spend most of day out at the stadium, as I’m out there to watch and code every game of the tournament. Because of that, I spend most of my day with all of the Analysts from the other countries. There’s a really good camaraderie amongst us, a lot of coffee and a whole lot of nerd talk. The best part of my job is simply being involved in the team. It’s a great working environment that always changes and never gets monotonous. As a sports tragic, I am extremely lucky to experience tournaments such as the Commonwealth Games, World Cup, and hopefully the Olympics in 2020! What do you do to switch off whilst on tour? I’m not sure if you’d call it ‘switching off’, but I make sure I run every morning as I’m often in training for something. I find it really helps me stay mentally fresh for the long days at the Stadium. I find it’s a great way to explore every new area that we play in, whether it be the streets of London, or trails through country New Zealand. Apart from running, I take a lot of pride in making sure I find the best coffee wherever we’re staying! What do you like to do on tour in your spare time? Most excitement you’ve had on the tour so far? 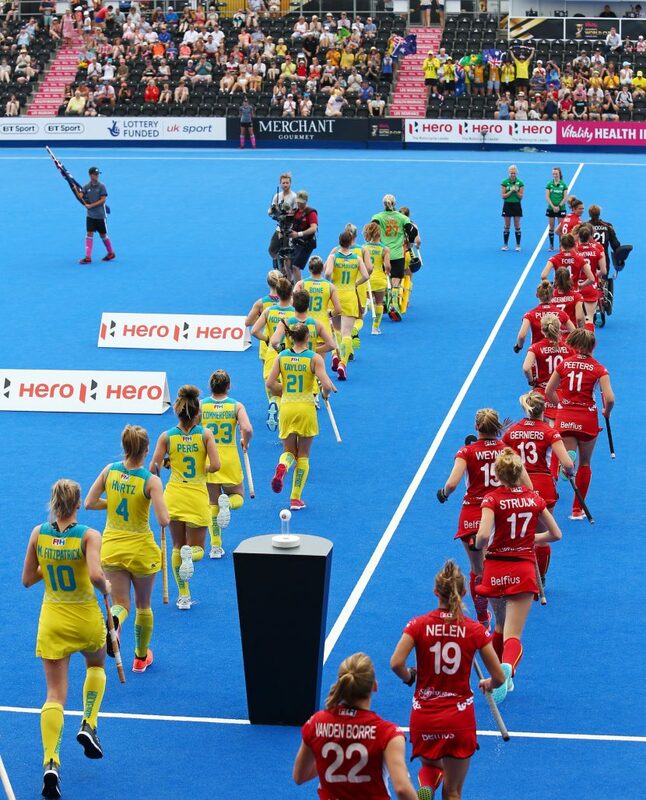 Most excitement so far on this tour was definitely the 1st match vs Japan and being 3-0 up at one stage. Do you get nervous during games? Yes I get nervous before games but I believe in being as best prepared as I can be. Yet I always endeavour to appear as calm as possible. 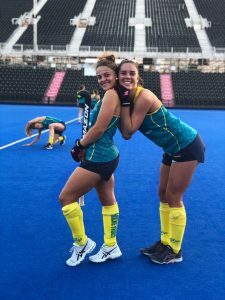 How does touring with the Hockeyroos compare to touring with the Kookaburras? 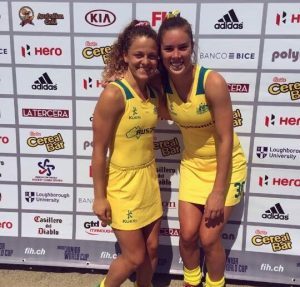 Touring with the Hockeyroos is awesome – it is truly a pleasure to tour with such a great group . 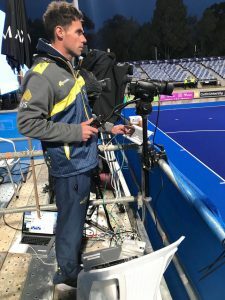 I have obviously toured with the Kookaburras more and know the players very well but it’s such fun being asked to tour with the Hockeyroos and being able to play my part in the roovalutuon! Your favourite part of the World Cup so far? How does this tournament feel compared to normal hockey tournaments? This tournament for me feels super exciting. The stage is so much bigger and the outcome is so much more important, making this such an great opportunity for our team. Who are you most excited to play against and why? Definitely NZ, we always have such competitive, fast matches against them and the outcome of the game can potentially put us straight through to the quarters! How do you deal with nerves before a game? I generally don’t get too nervous but I do love a good pre game sing-a-long to calm the nerves. My favourite part of the tournament so far has been running out onto the pitch for the first game! I could not stop smiling and laughing… it’s pretty crazy to be playing at such a major tournament in front of friends and family here in London and for everyone back home watching! Also scoring my first goal of the WC was incredible. For me, I am just trying to soak up every moment in this tournament. 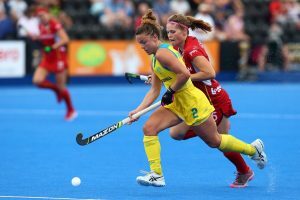 Just a few months ago I was sitting at home thinking that I’d have to wait another year to crack the Hockeyroos squad, and now I’m here playing in the World Cup with this amazing team! So it’s very surreal and I’m loving every second. Going into this tournament I was probably most excited to play the Netherlands as I’ve never played against them at a junior or senior level and they are currently World number 1 so I’d like the challenge of that… however with the way this tournament is going, I think every team is looking fierce and strong so I’d really love to play anyone! As a hockey fan, whats it like having a World Cup in your home country? It’s really exciting for the hockey community as you get to see the best players in the world on home soil, Hockey coverage in recent years has not been the best but is on the increase for us which is a plus thanks to some great achievements over the past few years which has helped us to promote the sport namely London 2012, Comm Games in Glasgow, Champions Trophy etc. 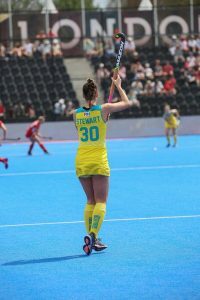 Due to these achievements we now have household names other than footballers, Kate Richardson-Walsh, SAM Quek and Maddie Hinch and now many hockey players and children have someone to look up to and the WC gives us the opportunity to see them in live action. The crowds have been huge so far. Was it hard to get tickets? Gaining tickets have been quite tricky. England Hockey opened up a ballot where you had to enter to see if you were lucky enough to get tickets. Once the ballot closed the tickets that were remaining were open to public sale, the main tickets such as the QF, SF and F sold out quickly and it was easier to get tickets for the pool games, although I have to say they were pricey for one of the sessions which meant that although the crowds were good they could have utilised sales with discounts. Would you say English fans are very patriotic or so they just enjoy watching good play? England have always been patriotic, Hockey has been played for many a year but without decent coverage but with recent success hockey is on the increase especially after Rio, in my Club for example we have had an increase of over 70% of juniors now playing and for once it’s good to hear kids talking about hockey and the future that it has.